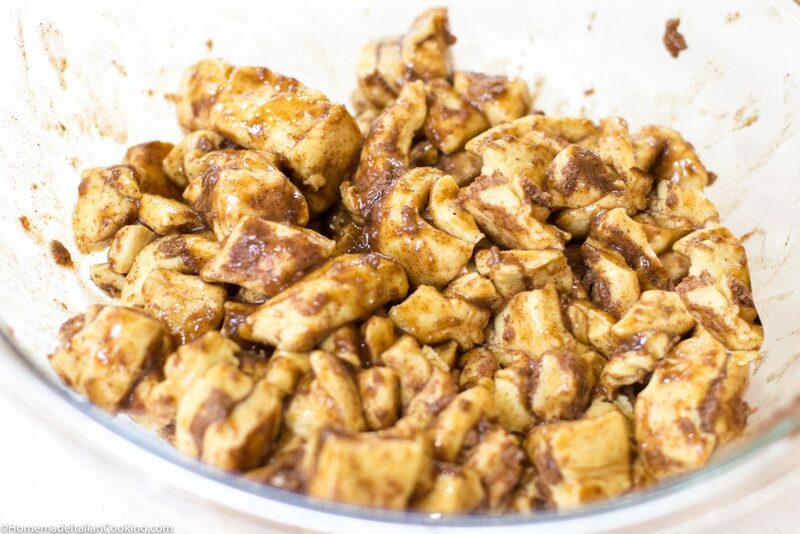 Home » Easy Glazed Apple Pie Cinnamon Roll Monkey Bread – Only 5 ingredients! 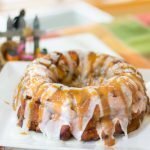 Easy Glazed Apple Pie Cinnamon Roll Monkey Bread – Only 5 ingredients! 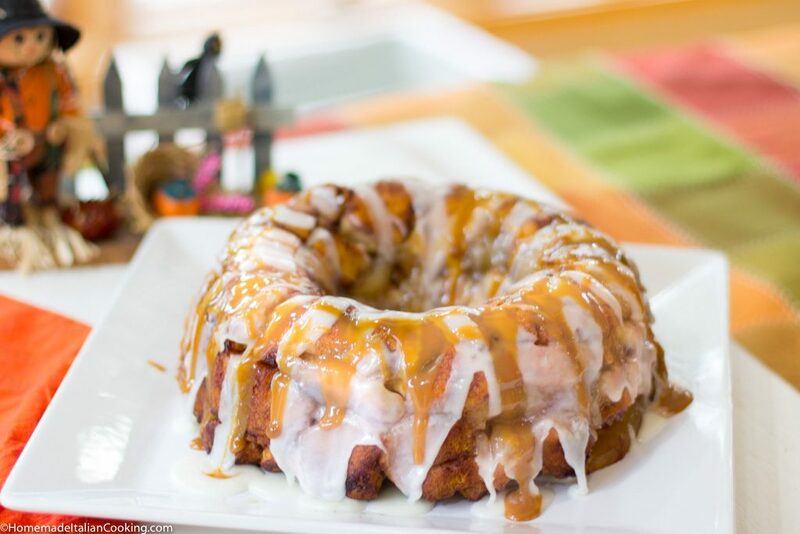 Apple Pie Cinnamon Roll Monkey Bread is the perfect weekend morning treat for your family! The smell of apple pie and cinnamon rolls baking in the oven permeates the kitchen. Add a good cup of coffee as a great way to start the weekend! It is quick and easy to make. 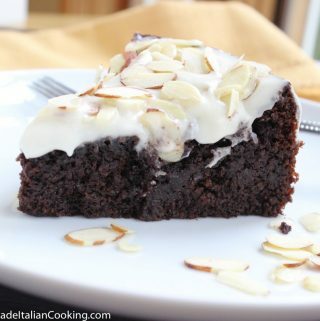 You need only 5 ingredients! Monkey Bread will be a new favorite for kids as well as adults. 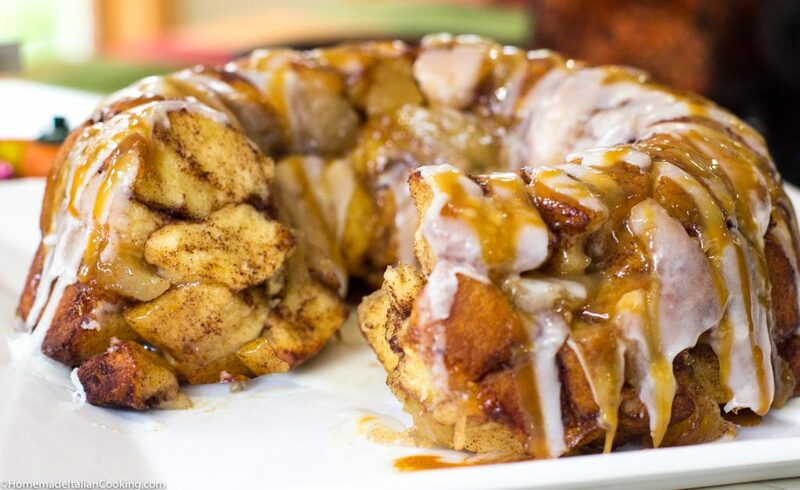 Monkey Bread is meant to be pulled apart with your fingers. 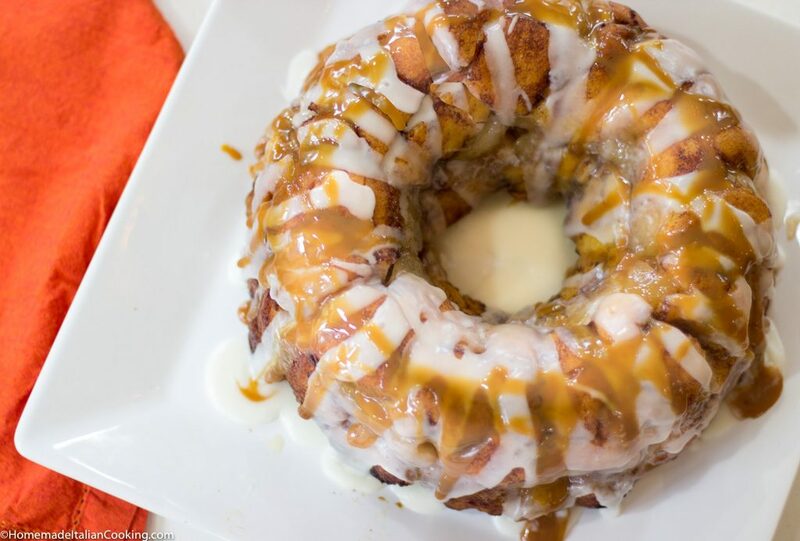 However, this Glazed Apple Pie Cinnamon Roll Monkey Bread version is a sticky mess and is best sliced and eaten with a fork. I love it served slightly warm – about 30 seconds in the microwave. The BEST part of this Monkey Bread recipe is that it only takes a few ingredients that can be found in your pantry – tubes of yeasty Cinnamon Rolls, a can of Apple Pie filing, some butter, cinnamon and brown sugar. Just don’t use the biscuit-style rolls. Look for a good yeast-based roll. Layer the dough and filling in a fluted tube (bundt) pan and bake for 30 minutes. So fast and easy! I like quick treats that can be made with pantry items. Cut the cinnamon rolls from the tube in bite-size pieces, about 6 – 8 per roll. Pour a mixture of melted butter, more cinnamon and some brown sugar over the dough pieces and toss to coat. Layer the coated dough with the apple pie filling in a greased Bundt Pan. Bake for 30 minutes at 350 degrees F. Let the cake cool, and unmold on a serving platter. Drizzle the sugar glaze from the tubes of Cinnamon rolls over the top. I added a drizzle of Caramel Sauce for extra awesomeness! Slice and serve room temperature or warm. I have already had a request to make it again for Thanksgiving morning! 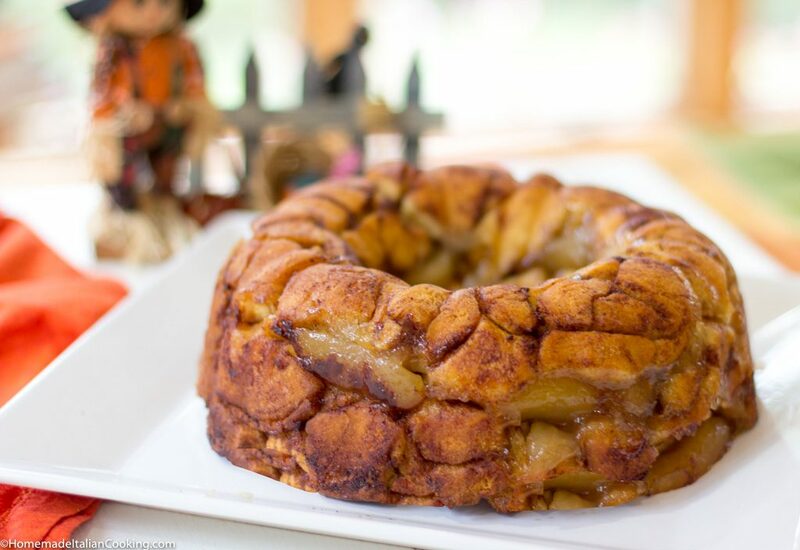 Apple Pie Cinnamon Roll Monkey Bread is the perfect weekend morning treat for your family! The smell of apple pie and cinnamon rolls baking in the oven permeates the kitchen. Add a good cup of coffee as a great way to start the weekend! It is quick and easy to make. You need only 5 ingredients! Generously grease a nonstick fluted tube (bundt) pan with baking spray or butter. Preheat the oven to 350 degrees F.
Melt the butter in a glass measuring cup with a pouring lip. Whisk in the brown sugar and cinnamon to combine. Allow to cool slightly. 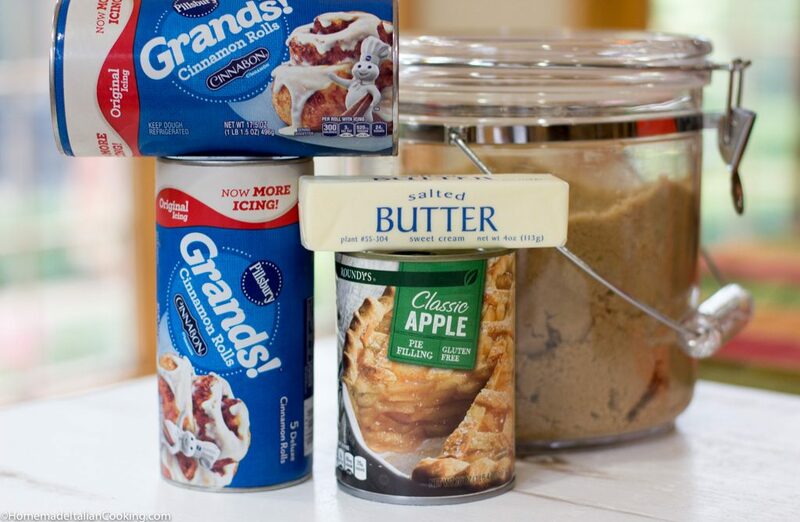 Remove the cinnamon rolls from the tube and set the frosting aside. 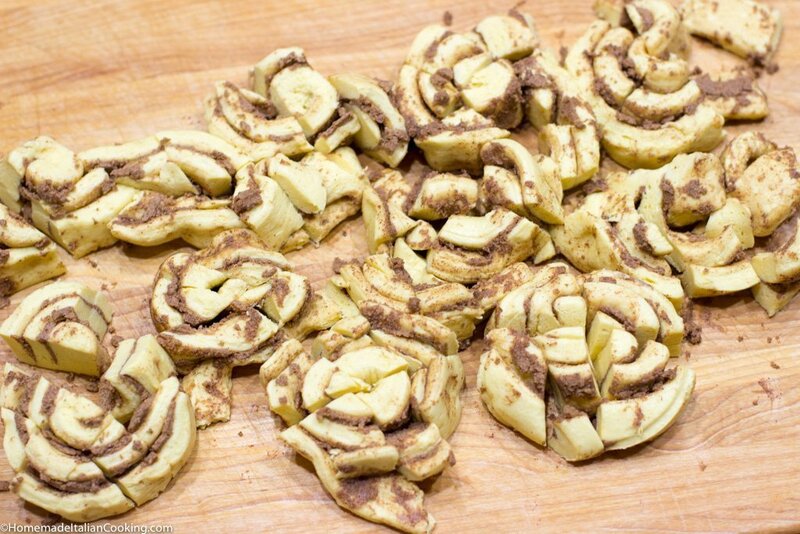 With a sharp knife or scissors, cut all the individual cinnamon dough rolls into bite-size pieces, about 6 - 8 pieces per roll. Transfer the pieces to a large bowl. Pour the butter mixture over the dough pieces and gently toss with your hands to coat each piece. Cut the apple pieces into smaller picees. It is easiest to just run a sharp knife inside of the can a few times. 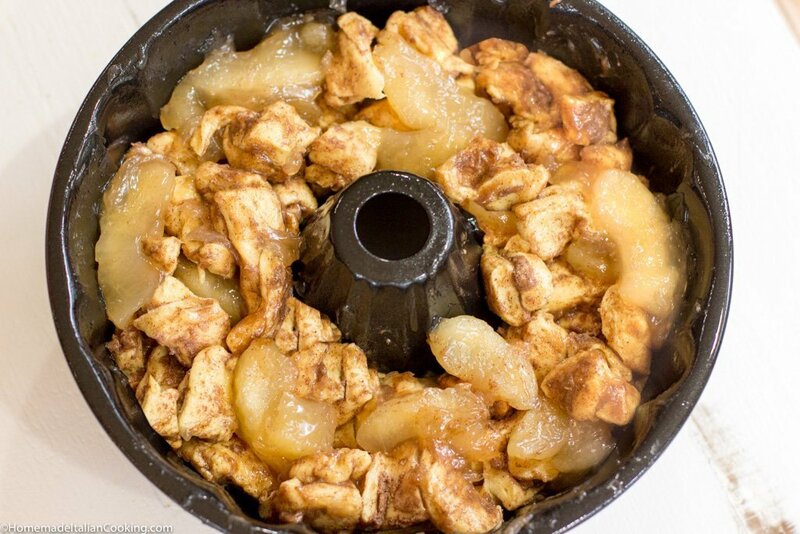 Add the apple pie filling and mix gently to combine. Transfer the dough/apple pie filling mixture to the bundt pan, evening out around the pan. Gently push down to fill in any holes and eliminate gaps. Place the bundt pan on a baking sheet (in case of spillage). Bake for 30 - 35 minutes or until the top is puffed and golden brown. Allow the pan to cool for about 30 minutes. Invert the bundt pan on a flat serving plate. Tap the top of the bundt pan with the back of a heavy knife to help unmold the bread. Allow the Monkey Bread to cool. Drizzle the sugar glaze on top. Bonus: For an extra boost, drizzle some caramel sauce on top of the sugar glaze.